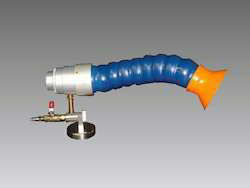 Providing you the best range of dust extractor with effective & timely delivery. Dust Extractor is a versatile and affordable compact air cleaning system is ideal for the removal of fumes, dust and other air pollution from work stations without the need for heavy and bulky machinery. The Nex Flow™ Stream Vac™ is an in line air conveyor that when hooked up to a 2” hose up to 25 feet (8 meters) and connected to a compressed air line, it will remove up to several hundred cubic feet of air while using only a minimal amount of compressed air, taking with it welding fumes, soldering fumes, particulate from local grinding operations, smoke and particulate from almost any “spot” application. A safe and improved healthy condition in the workplace improves employee morale, increases worker productivity, decreases absenteeism and even reduces insurance costs in many cases. A cleaner environment can even enhance the performance of machinery and sometimes cut maintenance costs. The Nex Flow™ Stream Vac™ is low cost solution to enhance the environment. This low cost, compact and portable unit operates utilizing a minimal amount of compressed air. It comes with a magnetic stand to “plug into position” on any magnet accepting metal surface. Simply connect the snap – on collection attachments and clamp a 2” hose on the opposite side, hook up your compressed air and you are set to go. Comes complete with shut-off valve and magnetic swivel base to position the unit any way you want. The air “gap” can be adjusted for a weak to strong vacuum. Looking for Dust Extractor ?